Or if you want to understand the behaviors of a user on Empire Avenue, tech blogger Chris Pirillo demonstrates his enthusiasm in this video. I should note there are two camps on what’s the point of Empire Avenue. One camp feels it is a site that evokes game theory and creates an interesting social dynamic for those who want to play the game. 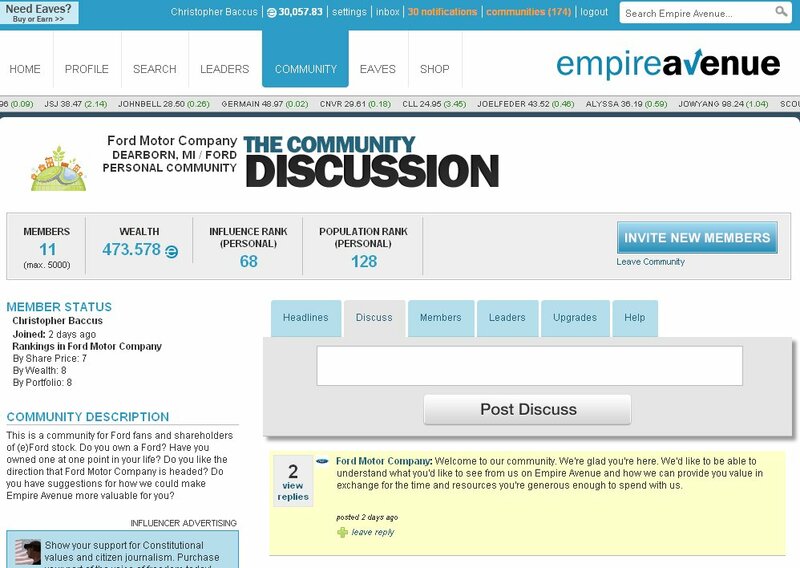 The other camp is more interested in Empire Avenue being viewed as a competitor to online influence ranking sites like Klout. This is the more controversial camp,, since whenever the word influence is evoked in social media circles everyone goes bonkers about what defines influence. For that perspective, checkout Stowe Boyd’s blog post and comments. 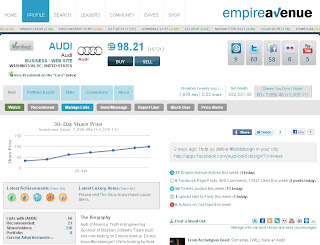 So what are the three automotive brands Ford, Audi and Toyota doing on Empire Avenue? Let’s take a look. Ford is the clear leader in the reciprocity behavior. As of this morning Audi has invested in 12 others on the site where Ford has invested in 118 accounts on Empire Avenue. 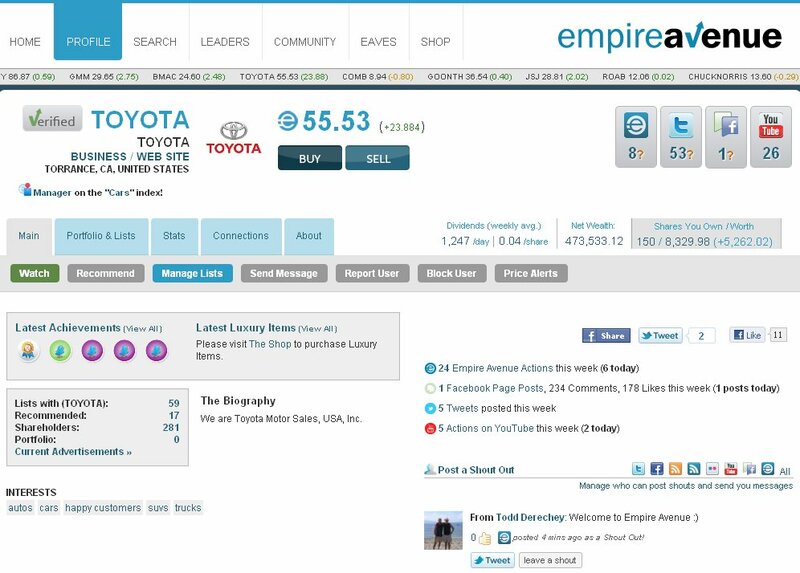 Toyota who recently joined Empire Avenue six days ago has yet to invest in anyone. Why do I point this statistic out? It demonstrates a level of engagement. Brands, like individuals on the site, have a few touch points including shout outs on a person’s wall, discussion within communities, and purchasing shares in others. 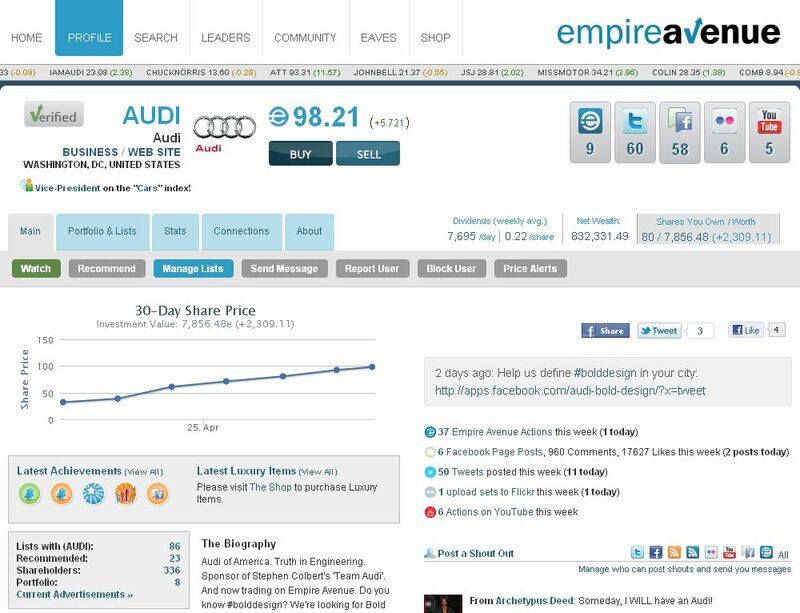 Buying shares back creates a conversation on Empire Avenue more so than say following someone back on Twitter; though, the concept is fairly similar. Here a purchase back is an opportunity to thank that person for investing in your brand and demonstrates goodwill. The purchase of shares is a big deal on Empire Avenue, like stocks in real-life, investments increase share price and also demonstrates a confidence in a good investment. 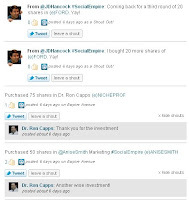 Brands that reciprocate back by investing in others create opportunities to engage. 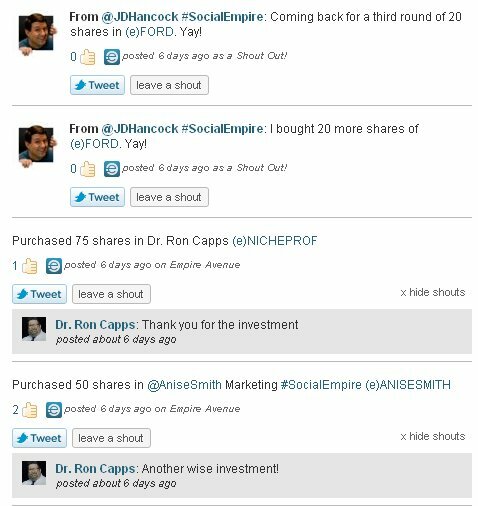 Consider the image at left showing Ford buying shares in others with another shareholder commending the purchase. Without buy backs, the opportunity for further conversation is limited. Sometimes these opportunities move beyond Empire Avenue conversation and into brand conversation about a person’s experience with the brand. Recently Ford, the most active of the three automotive brands on Empire Avenue, created a private community for Ford Motor Company. It’s a new effort with only 11 members so far and we’ll see how it evolves. A lot of things are evolving at Empire Avenue as more brands are joining everyday including Dell, Match.com, PR Newswire, and yes even Penthouse. It will be interesting to see if other automotive brands join, since Toyota joining last week no other automotive brands have followed Audi and then Ford’s move to join the site. What are your thoughts about Empire Avenue? Do you think it’s worth the time of automotive brands (or any brand) to get involved with this rapidly growing online community/game/influence metric? Ford's own Scott Monty talks about "The Gamification of Social Media"
PR Newswire's Victoria Harres writes "Empire Avenue Feels So Much Like 2008...And That's a Good Thing." Auto Brands ought to be looking at how quickly Empire Avenue can ramp someone up from a social media newbie to a successful content creator. The stock market part is the game, but the business section is the same - how can it help you do something quicker, better, or cheaper? The brands are fine, but imagine what you can do to train dealers on how they currently use social media, with the added value of tapping into their competitiveness. They want their stock higher, but the only way to do that is get more social. More posts, more comments, more likes, but of sufficient quality and sufficient relevance that your network doesn't rebel. A restaurant in St Louis just came up with a "tell us your stock ticker on EA and we'll give you an appetizer and buy 10 shares" promotion. Car dealers are great marketers. Do you think as the model gets better, they could create something similar in their market? Finally. I own a Mercedes. I'm in the market for a new car in December. I saw Audi join the game, and bought their shares (and sent them a note saying it was a buying signal). Do you think they could figure out a way to take those signals, turn them into sales, and then reap the media attention? I drove a Ford for 6 years before it. A good and faithful servant. Chris, with the addition of major brands on Empire Avenue it gives all the business minds a view into what can be accomplished and the value of social actions. It also shows just who is already out there creating content and working with their audience when you see the likes of Ford, relative to this post, roll to the top in share price and review their strong points on social media. You can't "fake" that type of social activity overnight. The last few weeks have been a game changer for me watching how things have unfolded on EA. I hope all the brands and businesses take time to get something out of the site rather than walk away shrugging it off as just a game. Jim makes a good point in his response.